First of all, let's talk about ceviche. It's properly thought of as a raw seafood salad, where the protein, usually fresh fish, is cured in a high acid marinade. The idea probably traces back in history to the first seaside camps near a citrus grove. But most folks recognize it as being Peruvian origin, by way of Mexico. 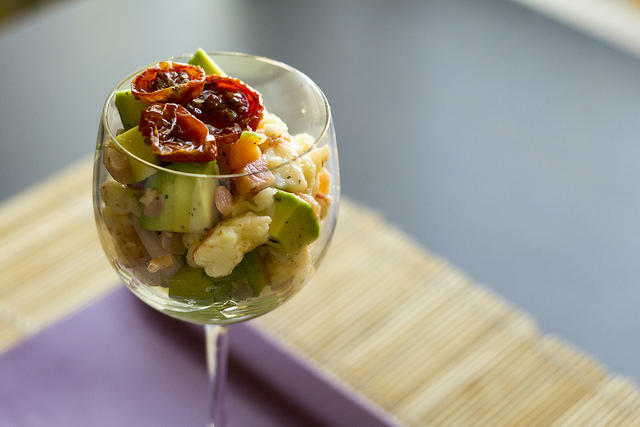 Essentially there are four elements to ceviche: the fish, the marinade, the salsa, and the seasoning, usually something with a kick. The fish is up to you, but a white fleshed variety is most often seen. The acid is based on citrus juice, with lemon, lime and grapefruit being the leading contenders. The salsa, on the other hand, can be made with any combination of chopped fresh vegetables, or even fruit, that's in season. Seasonings include salt, hot peppers, and leafy herbs like cilantro or parsley. Obviously, raw fish might not be to everyone's taste. We usually would modify the flavor by cooking, but in this case, it is marinated in a strongly acidic liquid. As Chef Jerry Pellegrino pointed out, the acid has the effect of "de-naturing" the fish protein, giving it the texture and appearance of having been cooked. Furthermore the marinade lends tangy flavor to the fish meat. How long should you marinate your ceviche? Many modern recipes say 5-30 minutes is sufficient. Others warn you that 4-5 hours is much better. More than that and the fish starts to come apart, which destroys the whole point. Whatever you decide on, you have to do it in the refrigerator. The entire process depends on keeping everything cold every minute of the way. Let's look at the Catfish Ceviche recipe developed by Chef Kevin Cauthorne of Myth and Moonshine Tavern in Baltimore. You'll get 1 pound of fresh Blue Catfish, and dice it into half-inch cubes. Your marinade will be 2/3 cup of grapefruit juice (equal to about 2 whole grapefruits) 1/3 cup of lime juice, the zest from one of the grapefruits, and one of the limes. Place all of the ceviche ingredients into a 1 gallon freezer bag, and then put the whole thing into a leak-proof container. Refrigerate for no less than 4 hours, and no more than 7. Cut a piece of fish open to see if it has "cooked" all the way through. If it is still translucent, you need more marinade time. To prepare the salsa you'll want the following: a beefsteak tomato, 1/2 a red onion, and 1 jalapeno pepper, seeds removed. Dice the vegetables finely and season with chopped fresh cilantro, dry oregano, kosher salt, granulated sugar, cumin, coriander, a pinch of cayenne and three whole cloves of garlic, pressed. Drizzle extra-virgin olive oil over the mixture. Refrigerate this as well. Take out your ceviche and drain it. Do not rinse it. Carefully blend the fish and the salsa in a bowl, garnish with lime slices and serve with tortilla chips. I surfed the web to see what other ideas were floating around out there, and not surprisingly, there were hundreds. Here are a few descriptions of some of them. Shrimp and avocado ceviche dressed with tequilla. In this case you will blanch the shrimp for just a few seconds in boiling water. Halibut ceviche with mango and jalapeno. The marinade is lemon and lime juice and jicama is a special ingredient. Watermelon tuna ceviche; poblano peppers and chopped mint blend for an exciting flavor. Tropical tuna ceviche works with lime juice, coconut milk, shaved coconut and sweet mangos. Finally, there are lots of recipes for crab ceviche, but virtually none of them advocate using live, raw crab meat. Packed meat, which has been steamed, is always called for. Then comes the cirtus marinade and the salsa, seasoned of course, with Old Bay.